Content delivery network BitGravity is launching its streaming video offering, BG LiveBroadcast. The company aims to make streaming video online as instantaneous and high-quality as streaming video on TV, while adding an extra layer of interactivity and customization. BitGravity already provides on-demand (i.e. recorded) video delivery for fifty clients, including Revision3 and Tom Green. Its streaming video service promises to bring the same robust scalability to live events, allowing thousands if not millions of viewers to watch the same shows simultaneously. If you want to stream live events using BitGravity, you can request a machine from them that will come preloaded with all the requisite software. Costs will then accrue depending on how much bandwidth you consume. Blist, a web-based application that promises to make database management as easy as using Excel, is launching in private beta this Tuesday. A number of improvements have been made to the product’s design since we covered it this past November. 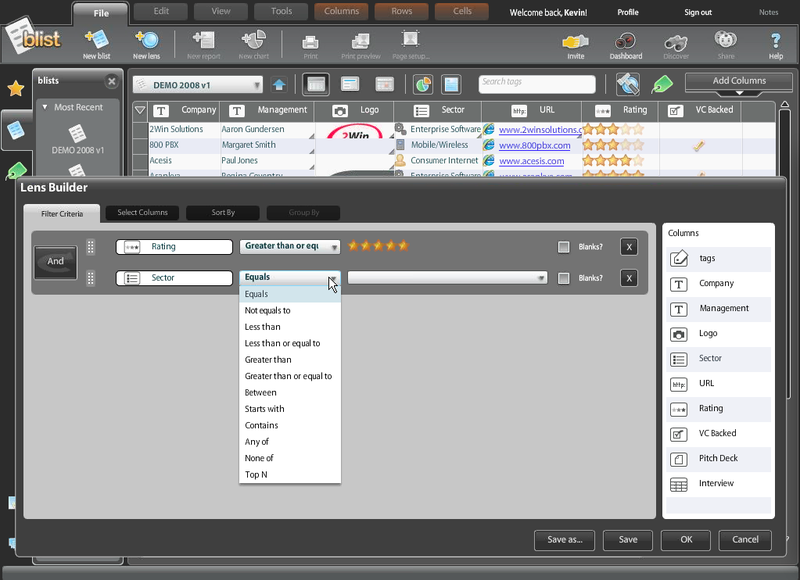 Of particular note is a new “visual query builder” that makes the construction of complex queries easy with a drag-n-drop interface. Blist’s approach to relational data is also notable; relationships are established primarily in the “design” phase of database construction, obviating the need to explicitly extract relational data during query time. If you become Blist beta tester, head over to InviteShare to share your five invites with others. Eyealike is announcing a service called Eyealike Copyright that will hunt down copyrighted material found in videos posted across the web. Eyealike purportedly has a knack for finding copyright material mixed in with user generated content on sites like YouTube. 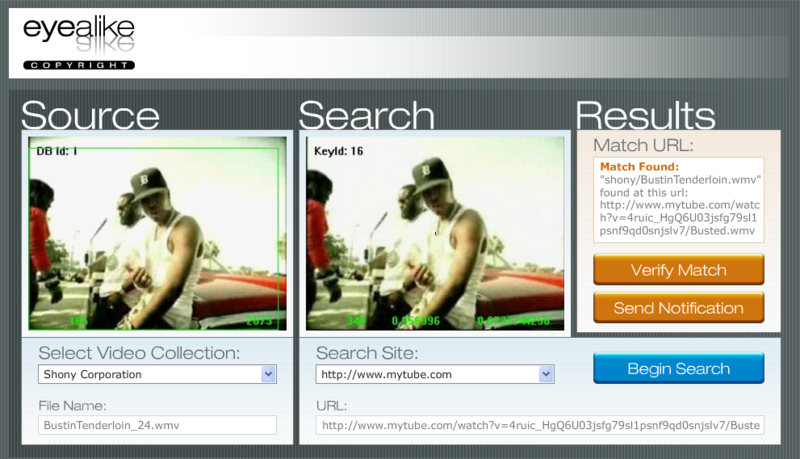 The company claims that its technology can “process hundreds of images and video clips per minute by still objects, object movement, and facial recognition” with 95% accuracy and a “near zero false positive rate.” Its web interface, pictured left, features a prominent “Send Notification” button that will allow companies like Viacom to speed up the process by which they send out take-down requests. With GoldMail, you can send slideshows accompanied by audio messages to friends, family, and business contacts. The goal is to enrich communication over the net by providing a way to send not only your voice but visual materials, such as photos and diagrams, that reinforce your message as well. While GoldMail soft launched a little while ago for consumers, it’s rolling out a business offering at DEMO with which companies can brand the service to their liking. For two examples of how organizations have used the branded service, see messages by the Mia Hamm Foundation and the Oakland Raiders. Enterprise pricing will start off at $5,000 per year, or $500 per month, for 10 seats. GoldMail will perform all of the customization work for their clients. good2gether seeks to help non-profit organizations broaden their reach by connecting them with media partners, sponsors, and volunteers. It’s described as part search engine, part social network. The main benefit to non-profits seems to be derived from the partnerships good2gether makes with media companies, a list of which will be announced at DEMO. Apparently these partners will include “major newspapers from six of the top 10 media markets”. Just how these media partners will benefit the non-profits is unclear. MOLI is a social network with the mantra “control your privacy”. Members, whether individuals or businesses, can manage multiple profiles, each of which can be made public, private, or hidden. For individuals, the value proposition seems to lie in the ability to create different personas for different contacts (friends, family, colleagues, etc.). I’m not sure just how this functionality will benefit companies who want to establish online presences. The company says its target audience is “25 to 55 year old knowledge workers (art and fashion designers, technologists, musicians, etc.) and the under served small businesses community”. SceneCaster is a virtual world offering that launched at DEMO in the fall and was well-received. 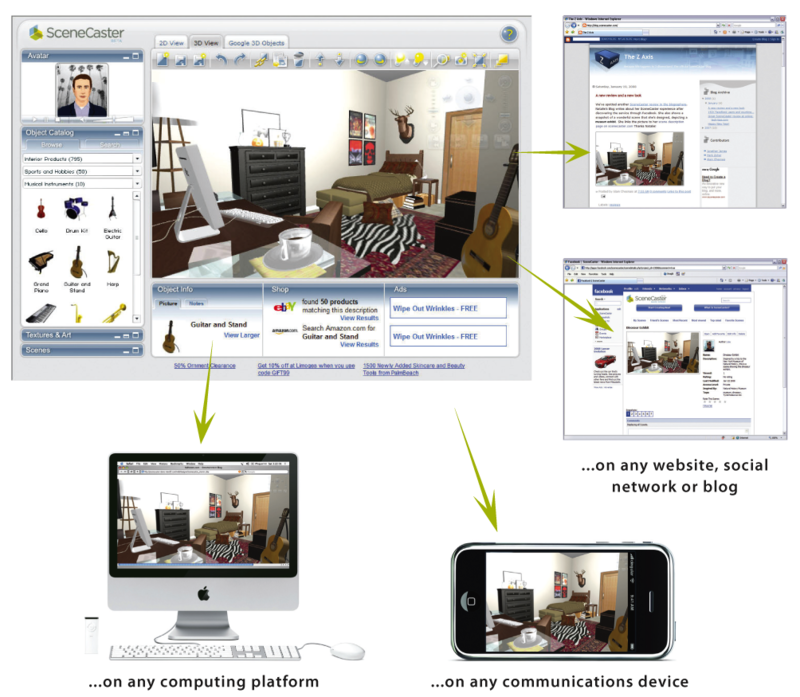 The company will use DEMO 2008 to promote its “SceneWeaver” technology, which allows users to access 3D environments through any XHTML compliant browser. The idea in a nutshell is to bring Second Life-like experiences to the browser, and it even works on the iPhone (no Flash or other plugins are needed). Online retailers can integrate SceneCaster with their websites to create 3D storefronts, and others can use the technology to create their own 3D webpages. StandoutJobs wants to help companies recruit more effectively by providing them with Netvibes-like pages that contain information for prospective employees. 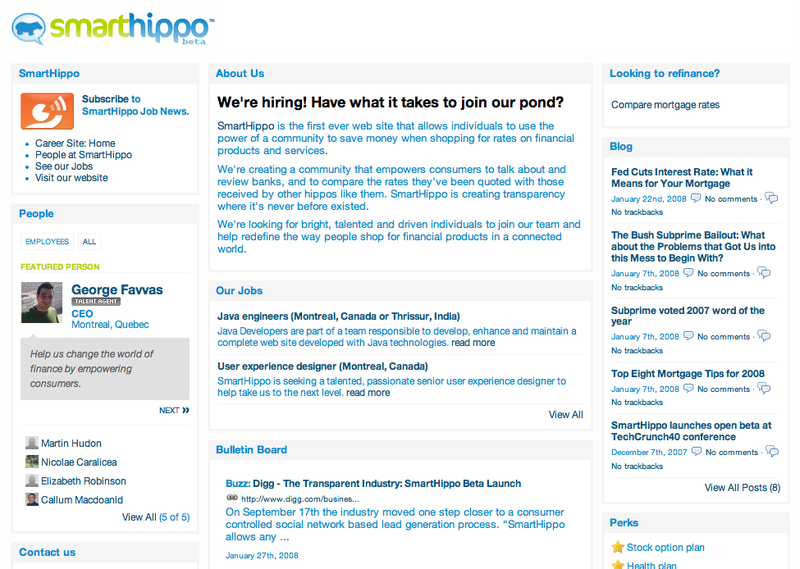 Companies can customize their StandoutJobs sites to include components that inform visitors about company culture, job opportunities, current employees, and more. Other, livelier features such as Flickr photos and quirky corporate videos can be added, too. While companies using StandoutJobs may risk looking like they’re trying too hard, these portals may also add a more personalized touch to the recruitment process. Voyant is launching a web-based financial software offering called Voyant @Home intended for individuals who want to gain “direct control over their financial health”. The software has been billed as particularly useful for generating “what if” scenarios and forecasts stemming from your current financial situation. Users can also use the service to track their financial goals.